Discover this exceptional apartment, part of a former farm that still produces some of its own wine and olives and grows fruit and vegetable crops. The apartment is exceptionally spacious and tastefully furnished and is located approximately 300m from the former farmhouse and the pool with its panoramic views. 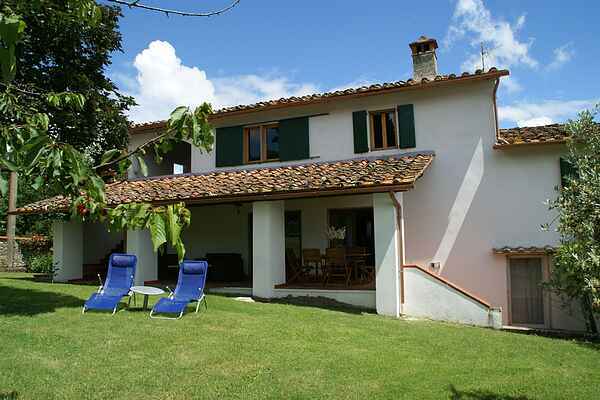 You have a view of the wonderful, green hills of the Chianti, the famous wine region. The apartment is located on the ground floor and has beautiful beamed ceilings and terracotta floors. From the covered terrace you can enjoy the lovely view. The flat is encircled by a communal garden. If you would like to discover the area, a drive into the Chanti is not to be missed. It is lovely due to the characteristic landscape and the charming villages like Greve in Chianti and Radda in Chianti (both at 20 km). Borgo di Casignano is also a perfect starting point from which to visit the impressive cities of Florence (40 km) and Siena (35 km). If you take the train from the small station in Giovanni (7 km) you will be in the historic centre of Florence within half an hour! You can also enjoy delicious food and do your daily shopping in San Giovanni. Arezzo (35 km) and Cortona (45 km) are also more than worth a visit. Casignano is a small 'borgo' in the heart of the Chianti and of Tuscany, with a history of centuries. The word 'privacy' is very important here. You will find your privacy at Borgo di Casignano. All the houses are spacious and in Tuscan style. You can go out for a walk in the hills of the Chianti region or you can go horseback riding. If you have a passion for cycling you can easy rent a bycicle. By car in one hour you can reach Florence, Siena and Arezzo (all about 50 km or less). My name is Luca Zappa, the owner, and I'm ready to welcome you and to help you to have the best holiday. If you are happy, I am happy. Our nice wines and our olive oil will help you enjoy your holiday even more. I will see you soon!